First off, don’t rule out the most exclusive properties. Deals are everywhere. Start by considering Orlando’s most exclusive rental villas. The Orlando rental market continues to recover from the 2008 slump. Owners of some of the most impressive properties are also often owners under the most financial pressure. Ask for a quote; at least that gives you an idea of ballpark costs that you can reference during your accommodation search. In Orlando, Reunion Resort is far ahead as most luxurious short term rental community with Windsor Hills and Emerald Island next in line. All 3 resorts are within 5 miles of the main gates of the Magic Kingdom Disney Complex. Be ready to spend several weeks gathering quotes for properties in several resorts. Create a spread sheet with headers for the following; Resort, Property URL (link to where you found the property on the internet), owner/management company (who provided the quote), phone number (phone number for owner/management company, check-in and check-out. Keep a record of the dates you’ve been quoted for. Firstly, identify the resorts you would consider staying in. If your holiday involves Disney World then you might want to only consider resorts nearby. Then identify properties within those resorts which meet your requirements and standards. Send off enquiries and begin to negotiate. Once you have your resorts and properties identified, the list of properties may run to over 100, begin researching properties online. Sites such as Disboards and Tripadvisor are great for getting reviews and views from holidaymakers who have stayed at the property. Never forget that service is important so good reviews matter. Even if a property looks great if the service provided isn’t there your holiday will be impacted. A great way to land a deal is to look through property availability calendars and submit enquiries or dates that help the owner or management company fill awkward slots. Perhaps 10 days are free but surrounded by months of bookings either side. As those 10 days approach the property manager will be keen to fill them and will be more open to negotiations on price. 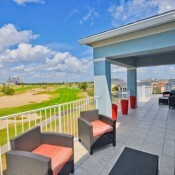 Some resorts such as Reunion Resort have large waterpark and championship golf courses. These often come with restrictions or costs. Ensure you know what you have access to and then negotiate. Perhaps you can get access to some of the facilities free of charge. Last but not least, once you are there make sure you fully utilise the villa and the wider resort facilities. Spend your days relaxing by the pool and enjoy evening meals on the villa patio. It’s a great way to save money while you are there.